The System of Rice Intensification (SRI) has been promoted in rice growing areas worldwide – including Tanzania’s Kilombero district – aiming to reduce the cost of production while improving farm-level productivity, and thereby increasing household income and food security. Kilombero valley in Tanzania is a high-potential area for rice production, where it is the main staple as well as the leading cash crop. 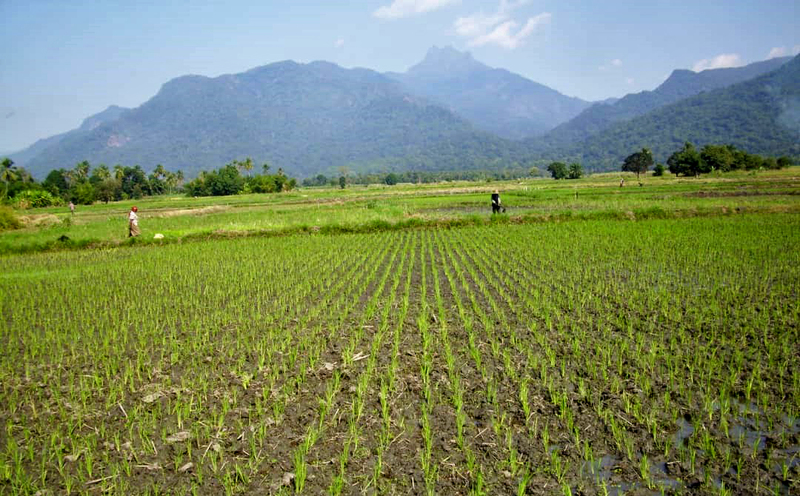 Over 90% of the rice in Kilombero is rain-fed and is grown on lowland rice fields. Under the traditional rain-fed farming system, rice fields are covered with flood water from February to April, which poses several challenges – including crop loss due to water logging, soil fertility loss due to leaching and reduced supply of water for downstream water users. During the 2009/2010 cropping season, Kilombero Plantation Limited (KPL) – a large-scale producer of rice and maize within Mngeta division – working in collaboration with USAID and other financial development agencies, introduced SRI technology in order to improve productivity and production among smallholder farmers. Timing: Under SRI, younger seedlings are transplanted when they are only 8–12 days old, as opposed to 21–40 days old under rain-fed conditions. Number of seedlings, depth and spacing: Rather than broadcasting or planting 3–4 seedlings per hole, only 1–2 seedlings are planted per hole, at a depth of 1–2 cm and a wider spacing (20 × 20 cm) in order to prevent resource competition. Water Management: Under SRI water is managed such that continuous flooding is not necessary; rather, water is added or taken out of the field to facilitate maximum tilling and health of the rice seedling. Agricultural extension officers also emphasise using organic fertilisers and pest control practices as an important component of SRI. Some of the farmers in Mngeta have already adopted and mastered the technology. 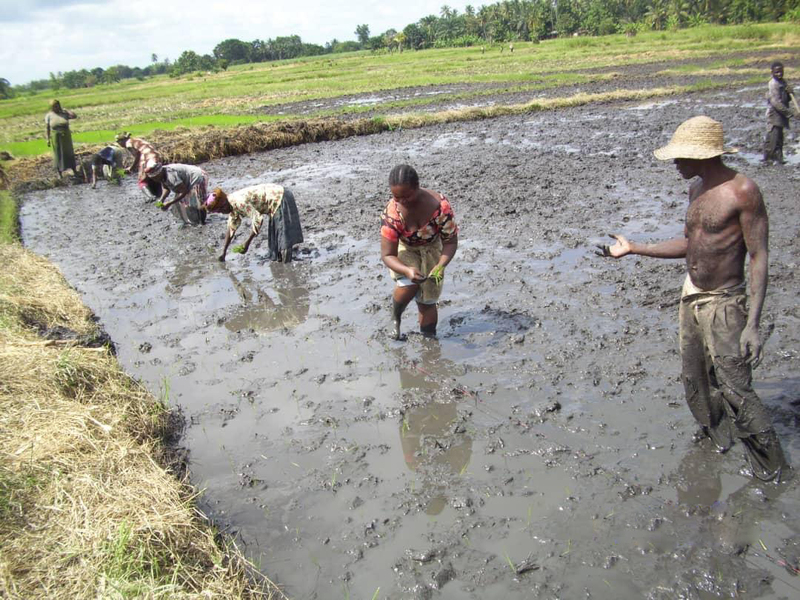 “Instead of continuously flooding paddy fields, SRI methods use smaller quantities of water to alternate wetting and drying the field during the growing cycle, reducing water requirement and production cost,” explained one respondent from Mngeta village. Since its introduction, SRI technology has evolved into a participatory learning process that offers farmers a range of management practices to adopt selectively according to local conditions and resource access. “Initially, we thought SRI was a strict recipe, but now we recognise that SRI methods present a menu of different practices to be adapted to suit local conditions and cropping systems,” said one respondent, during data collection in Mngeta village. Discussion with KPL staff revealed that the company has been collaborating with other development agencies to promote SRI, training over 8,000 smallholder farmers in 10 villages within a 30 km distance around the farm, covering about 10% of all the farmers in the area. Moreover, SRI group members have benefitted from credit-covering inputs (seed, fertiliser, and herbicide) and farm implements (ox-plough). The technology promoters, including KPL, USAID and even the government, had expected that by using SRI smallholder farmers in the villages surrounding KPL would raise productivity from less than 1 t to 3.5 t/ha under rain-fed conditions, and up to 6 t/ha under SRI’s irrigation system. According to a survey conducted in October 2017, more than 50% of farmers who have adopted SRI reported to have gained economically, recording significant yield improvement. Nonetheless, not all farmers in the area report this rosy picture of SRI. While some farmers acknowledge to have benefited from the knowledge and skills acquired through the training and credit services they received, other farmers feel that SRI has not lived up to its promise on productivity or livelihoods improvement – citing the failed first round of credit and subsequent efforts to recover loans. Other farmers have abandoned SRI altogether, saying that it is considered too labour intensive. Uptake of SRI practices remains relatively minimal compared to the number of farmers who were trained by KPL and other partners. While seed selection has been more widely adopted, most farmers tend to avoid SRI components that require monetary investments, such as agrochemicals. Some farmers also continue to plant local varieties due to buyers’ preference for aromatic varieties that are more readily marketable. Hence the adoption rate of improved rice varieties even among SRI members remains low. However, all hope is not lost. SRI converts have continued to benefit from training and credit facilitation. There is a sizable level of uptake in some villages, such as Njage, Itongoa and Chita, where sustained interest in SRI has mostly been attributed to groups having strong leadership. The existence of a functioning irrigation scheme in Njage village has had a significant influence on the farmers’ choice to support an active cooperative union. 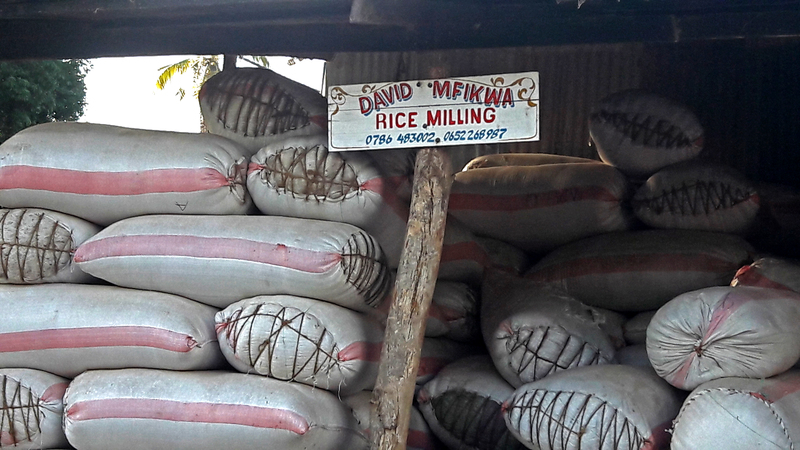 Farmers have embraced this technology, some of them recording yields of up to 40 bags per acre (7 t/ha) compared to the previous 25 bags (4.3 t/ha) or less using traditional varieties and conventional methods of rice production. In future, these farmers are expected to continue embracing the technology, using the knowledge and skills acquired during the last 10 years. Focus group discussion participants confirmed that SRI can potentially reduce water use, increase land productivity, and reduce reliance on herbicides – reducing overall production cost. Engaging community members in all stages of SRI under participatory approaches – through SRI groups, for example – encourages members to take up the entire recommended technology package, and those who have done so have achieved significantly higher yields.